Spitfire F. Mk.VB W.3228 has been fitted with a special Merlin 50 engine, on which the supercharger impellor was "cropped" to a diameter of 9.5". On this engine the maximum permitted boost at combat rating was +18 lb/sq.in. instead of +16 lb/sq.in. as on a normal Merlin 50 engine. Climb and level speed measurements have been made at this combat rating and form the subject of this report. Mk. VB wings with 1 x 20 mm. gun and 2 x 0.303" guns fitted in each. No stubs for further 20 mm. guns. Muzzles of all guns sealed, ejection chutes open. Aerial mast complete with aerial. External rectangular rear-view mirror without fairing on forward side. Temperate type air intake without ice guard. Oil cooler exit duct not flared. Indivdual ejector exhausts stubs of a flattened type. A Rotol 3-bladed propeller, Type RX5/2 of 10 ft. 10 ins. diameter. A Mk.VIIIC pressure head was fitted at the normal position under the port wing. 2.3. Loading. The tests were made at a take-off weight of 6,450 lb. This was the weight of the aircraft with full equipment and fuel. (a) Partial climb tests between 5,000 ft. and 7,000 ft. and between 29,000 ft. and 30,000 ft. to determine the best climbing speed. (b) Climbs to 35,000 ft. at the combat rating of para. 2.2. Combat rating is permitted for 5 minutes only, but for test purposes a concession was granted to permit full climbs to ceiling to be made. All climbs were made with the radiator flap fully open, and at the best climbing speed as found from the partial climb tests. (c) Measurement of all-out level speed at heights between 2,000 ft. and 24,000 ft. with the radiator flap in the minimum drag position. The best climbing speed from the partial climb tests was found to be 170 mph. ASI. up to 6,000 ft., decreasing by 2 mph. per 1,000 ft. above this height. The results of the climb and level speed measurments are given in full in Tables I and II and in Figures 1 and 2. These results have been corrected to standard atmospheric conditions by the methods of Report No. A.& A.E.E./Res/170. The level speed measurments have also been corrected to 95% of the take-off weight viz. 6,120 lb. by the methods given in the same report. 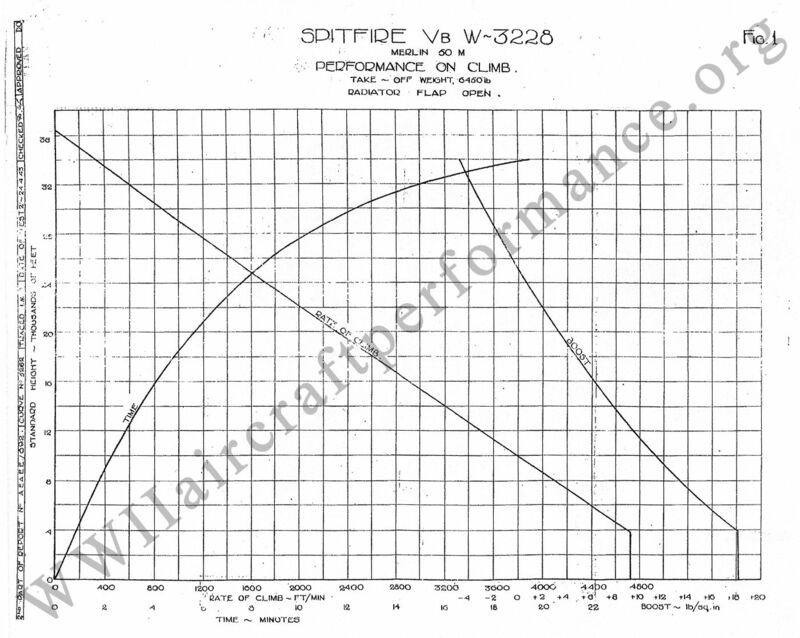 In calculating the level speeds, the position error correction curve measured on Spitfire VB A.B.320 and reported in the 24th Part of Report No AAEE/692,i was used. Both aircraft had Mk.VB wings with the same armament installed and with similar pressure head installation. The compressibilty correction used has been calculated by the method given in the Addendum to Report No. A.& A.E.E./Res/147. In addition a strut correction has been applied based on the results given in A.R.C. Report 6420. Estimated absolute ceiling 36,400 ft.
Max level true airspeed at 5,900 ft. (FTH) 350 mph. Max level true airspeed 10,000 ft. 347 mph. Max level true airspeed 20,000 ft. 336 mph. It will be seen that the maximum permitted boost was exceeded by 0.2 lb/sq.in. both on climb and in level flight. The effect of this performance will be negligible (about 10 ft/min. on climb and under 1 mph. in level flight). No comparable performance measurements have been made on a Spitfire VB with the Merlin 50 fitted. The only difference between a Merlin 45 and 50 is the fitting of a "negative g" carburettor and a fuel de-aerator on the latter engine, and these are unlikely to have a marked effect on performance. Comparison is therefore made with the results obtained on a Spitfire V with a Merlin 45 engine fitted. Such a comparison, however, is complicated by the variations of performance which have been obtained on the type. Tests at combat rating with the Merlin 45 engine fitted were made on Spitfire VC A.A.878 at a weight of 6,695 lb. Allowing for this difference in weight, the maximum rate of climb is higher on W.3228 by about 700 ft/min. at heights below 3,800 ft. but above 8,000 ft a lower rate of climb is obtained. In level flight W.3228 is faster by 9 mph. TAS. at heights below 5,900 ft., but above 8,000 ft. A.A.878 is faster, the difference of speed being 25 mph. at 13,000 ft., the full throttle height on the Merlin 45 at combat rating. Take-off weight 6,450 lb........... Radiator flap open. 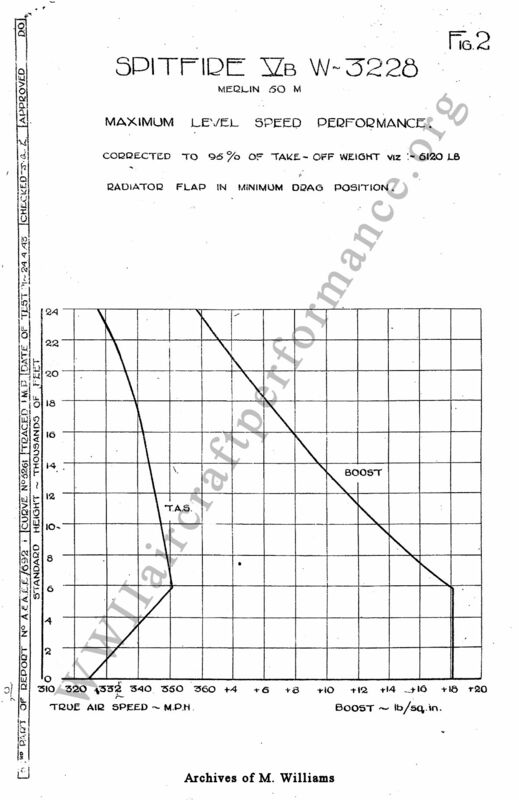 Corrected to 95% of take-off weight, viz., 6,130 lb.